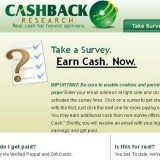 “Cashback Research” found at cashbackresearch.com is a survey database site that offers their affiliate partners’ links for free if you join. You supposedly get paid either through PayPal, or in form of gift cards. As a portal or host to other so-called survey sites, it is disappointing that most of those sites are just this side of shady. “Cashback Research” makes their money by collecting a commission for each survey site that you sign-up with through their affiliate links to those sites. You will not earn much from any of those survey sites, and they will collect any personal information you give Cashback Research and they will use it to sell for marketing purposes. Most surveys offered by Cash Back Research’s affiliate partners make you to spend at least five to ten minutes answering questions then they tell you you’re not eligible. Meanwhile they have gathered your personal information for nothing in return. Many times, if you qualify you won’t get credit for the survey you just participated in. The ‘bonus’ surveys often don’t work either. The usual payment on average amounts to one to five dollars or so for spending ten to twenty minutes of your time on them. Most survey sites from Cashback Research have a minimum payout of about ten to twenty dollars before you can cash out your reward and it usually takes a few weeks to reach the goal. If you opt to receive your money through PayPal there is usually a fee involved that PayPal will deduct before paying out. Choosing to get paid in gift cards has a minimum payout of about twenty five dollars and will take at least thirty days to receive payment. I have seen many Cashback Research complaints of people not even receiving their rewards in the first place. Once in a while Cashback Research offers product testing but you must be careful with those as the products they ship you must be returned within a specific time frame or they will charge for the product. Some complaints deal with ‘Cashback Research’ stopping crediting rewards soon as you reach the silver level. Their customer service is not that great either. Most of the time if you do get their customer service department they will give you the runaround. Because it’s free to join, they might not be a paid surveys scam, but I do not recommend you waste any time with Cashback Research. The only way any of you would be having any sort of trouble would be because you are not using common sense. Any of the survey sites are completely overwhelmed and can use all the help they can get from their participants giving them heads up. As an example whenever I join a new panel, and want to make sure that I get credit for doing so, I simply write out a support ticket requesting credit for joining the new panel. Simple. It is VERY easy to LOOK for excuses to complain about one site or another. After all, in the end, they are just people trying to earn a living, just like you and I. We all make mistake, overlook something, get overwhelmed. Just go to the bottom of the site, click on “Help” and send in a support ticket! Easy enough, right! ?